Yesterday I received the Christmas edition of Tickle the Imagination magazine in my inbox. I knew straight away that I would be making a snowman that day. And I did. Even after I realised I had no white felt in my stash, I was not deterred. I used blanket stitch around the edge of the linen and hope this stops it from fraying. I will be making a few more of these, I am sure. 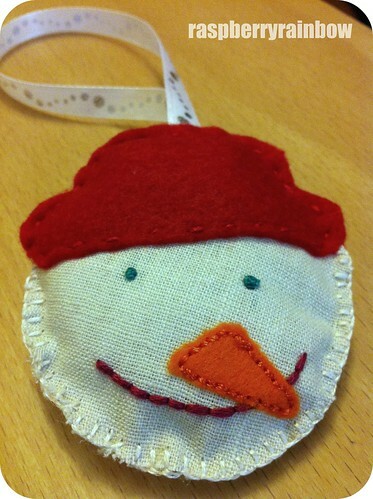 The blanket stitch is inspired in white as it looks like Santa's beard. Oh he's just gorgeous Cat! And so nice to see the festive spirit kicking off... I wasn't really in blogland over Christmas last year, but feel I am in for a treat with all the amazing talent around the place, this year.